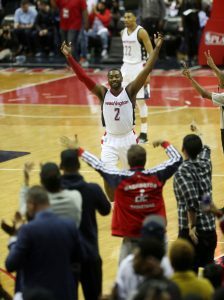 John Wall Celebrates and Runs Over to Fans After Defeating Atlanta, 109-101, Taking a 2-0 Playoff Series Lead. For any fan in attendance tonight for Game 2 of the Wizards and Hawks, it was tough to say that the energy in the building has been this electric in a long time. The final three minutes of the game and dominance by John Wall and Bradley Beal, helped propel the Wizards to a 109-101 victory and a commanding 2-0 series lead. The Wizards capitalized on their first home-court advantage since 1979, winning twice in Washington before heading to Atlanta for Game 3 Saturday. Teams up 2-0 with two home wins in a best-of-seven series have won 94% of the time. For the Wizards the comments after Game 1 of playing MMA Style hoops by Atlanta’s Paul Milsap was anything but that in this game as the refs seemed to call any and every foul they possibly could and it landed the Wizards in some early trouble and eventually sent Jason Smith the bench fouling out of the game in the fourth quarter. Paul Millsap led the Hawks with 27 points and 10 rebounds, and Dennis Schroder scored 23 points. But Dwight Howard had only seven rebounds, half his Game 1 total, and six points. One of the game changing moments came when Brandon Jennings hit two back to back shots in the fourth quarter and eventually accounting for eight consecutive Wizards points during one stretch — making three baskets and assisting on another. “It was another great team effort by our guys tonight. When Keiff got into foul trouble, Jason came in and got some good minutes, unfortunately he also got into foul trouble as well. I thought Brad and John led the way again tonight and we know these guys will be excited come Saturday night in Atlanta with a chance to take a 3-0 lead, said Wizards Head Coach Scott Brooks. Wizards Debut New Team Look Tonight Against Cavs, Does this Deal Make Sense? After Loss to SMU, What’s Next For the Hoyas? 2019 Caps, Are the Good Enough to Repeat as Stanley Cup Champions?